And with that, it's time for us to sign off. We're back tomorrow, when England will attempt to bowl out Australia cheaply and wrestle back some control in this match. Thanks for your contributions today. See you on day three. Night. "These teams don't play this format very often and it's about who adapts quicker. Australia have adjusted better. England don't look like they have made the mental shift on how to adjust your game." And that is stumps. Australia walk off for the day with a lead of 106 runs. A long knock from Anya Shrubsole (47 balls) is ended when she is pinned in front. She didn't score any but she did hold up an end and allow Katherine Brunt time to plunder a few extra runs. Kate Cross, the England number 11, takes two balls to get a single. Anya Shrubsole is still on nought. Only when 43 deliveries have gone by do such innings become interesting. "That was a perfect delivery, hitting the top of off. Katherine Brunt was caught on the crease and didn't move her feet as much as she had been. But Brunt has brought some positivity to the innings." A plucky knock is ended when Coyte gets one to nip back in, stay slightly low and peg back Katherine Brunt's off stick. Katherine Brunt goes for the short ball, hoicking it towards the fielder at long leg. It drops short though... just the single and a wry smile. I'm told the record Anya Shrubsole is blocking her way towards is 68 balls. Against India last summer, Anya Shrubsole scored 14 off 70 balls. Katherine Brunt is shouldering the burden of run-scoring on her own as she slices three backward of point. The record for the longest duck in men's Test cricket is 77 balls, by New Zealand's Geoff Allott against South Africa in 1999. If anyone knows what the record is in women's cricket, please get in touch and let us know. Anya Shrubsole is 0 not out from 42 balls - she's third on the list of longest innings without getting off the mark. This is good from Katherine Brunt - she steps back in her crease and wallops Jess Jonassen through the off side for four. Anya Shrubsole is still to get off the mark. New ball is now due. A painful moment for Katherine Brunt when she gets an inside edge and the ball cannons into her foot. That'll bruise. Anya Shrubsole sways out of the way of a bouncer, then digs out a yorker from Holly Ferling. That's 36 balls without getting off the mark. Katherine Brunt does nothing by half. She bowls as fast as she can and even when taking a single with the bat, she belts the ball down the ground. It's effective though. A heart-in-mouth moment for Katherine Brunt as she skews an attempted pull shot miles up in the air, but Aussie skipper Meg Lanning can't reel it in running back. Anya Shrubsole is playing herself into the role of number one nightwatchman here. She's blocking everything with an assured confidence. That's 28 balls without score now. It's not all about England v Australia - in Galle, the first Test between India and Sri Lanka got under way today. It was an excellent day for the tourists, who skittled Sri Lanka for 183 and then reached 128-2 at the close. Ravichandran Ashwin did the damage with the ball, taking 6-46, with Shikhar Dhawan hitting an unbeaten 53. Katherine Brunt creams the ball through the covers for four. In the shortest form of the game, her strike-rate is 99 - so she certainly knows how to connect with the ball. Katherine Brunt is playing a nice little cameo here, sweeping Jonassen for three more - the slow outfield denying her a boundary. Anya Shrubsole is equally as gritty, she's now gone 22 balls without scoring. Jim Maxwell reckons these two England batters will dig in, purely so they don't have to bowl again tonight. We've still got 13 overs left in the day, mind, after that rain-delayed start. England advance the scoreboard with the help of a no ball and a single into the covers. These two have a combined Test career batting average of 24. England would take that now - every run counts in such a dire situation. Maiden over played out by Anya Shrubsole. "Perry and Schutt are trying to entice Shrubsole into playing that shot that she likes off her legs, and trying to get her caught behind down the leg side." Fast bowler versus fast bowler - Ellyse Perry charging in to a fired-up Katherine Brunt. Three from the over. Katherine Brunt doesn't get tied down for long - whacking Jonassen for four down to backward square when the spin bowler errs down the leg side. But that's just an appetiser as a full toss is hammered for another four over cow corner. Almost a six. Make that 10-9-4-3. Sorry... it's difficult to add much more. How about these for figures. In the last nine overs, there have been eight maidens, four runs scored and three wickets taken. 9-8-4-3. Australia have found a gem in Jess Jonassen, who is getting nice air and revs on the ball. She's a very dangerous left-arm spinner who looks like she will take plenty of wickets in her career. Katherine Brunt is trying to get forward to the all-rounder but it's another maiden over. Charlotte Edwards has her head in her hands on the England balcony. Her side have played out 30 overs now. "It was a tentative prod outside off - oh Marsh, you muppet!" Laura Marsh once batted for 304 balls for 55 runs. Not today however as she pokes at one outside off stump and the ball is easily taken by the keeper. Six more dots. Nothing else to add. There's still 21 overs left in the day. Will Australia be batting again before the close? "If you catch a six in the crowd you get £1,000. My money would be on Katharine Brunt hitting it square of the wicket off one of the fast bowlers." England have avoided the follow-on at least. However, they are still a long way back in the game. Katherine Brunt refuses to back down - pulling Jonassen for a powerful four. "It's an absolute peach of a ball from Jonassen. It's turned and bounced and gone through the gate. She'll be thinking about that for many moons to come." That's a ripper. Australia's first innings hero Jess Jonassen gets the ball to pitch on leg and knock over the off stump. Shane Warne-esque and Georgia Elswiss is sent packing. Megan Schutt has got me randomly doing an internet search for Carl Shutt. Where is he now? "It just skidded on down the hill and I think that was Natalie Sciver's undoing. It was a tired-looking shot." I'm marking that down as a bad decision - Nat Sciver has suffered a stinker. The ball was sliding down the slope and, in my opinion, past leg stump when it hit her. Australia don't mind... they're into the England tail. It's as though the Australians have realised they don't get paid overtime - they are racing through their overs now. Three maidens in a row. Another swift maiden over for Sarah Coyte, who has a catcher stationed at a third slip/gully position. All looks a bit odd, especially as the fielder is wearing a helmet. "You just sense that Georgia Elwiss's arrival at the crease has galvanised Natalie Sciver." Jess Jonassen must have somewhere to be. She races through a maiden over quicker than you can say shanewatsonisoutlbw. A stroke of luck for Georgia Elwiss when she almost chops on to Sarah Coyte, instead taking a single to fine leg when her shot was aimed through the covers. Australia's Jess Jonassen, who was out on 99 earlier today, concedes just a single from her latest set of six. But I'm not sure how - she was clubbed to a fielder time and again by Nat Sciver. "For England, it's about sustaining this partnership until the end of the day. If they can do that, they're in the game." This partnership is worth only 30 runs, but it has really stalled the Australian juggernaut. Georgia Elwiss continues to be the aggressor with a back-foot punch into the off side and she sets off like a train to take a single. She wanted two. Not happening. Former Australia keeper Ian Healy is sat in the comfy seats, looking like he's just got dressed for a round of golf. He'd have been proud of Natalie Sciver's pull for four when Jess Jonassen drops short. Decent little knock this. "I think it's time to give Perry a rest. She's almost trying too hard." Indifferent bounce? Ellyse Perry, one of the quickest on the circuit, sees a half-tracker die in the surface and trickle through to the keeper. Soul-destroying for the bowler. Here's something to cheer her though... of her 90 legal deliveries, 76 have been dot balls. Not too shabby. Time for a bit of twirl from Jess Jonassen, who had a couple of overs before the tea-break. It's high, loopy, left-arm fodder, but Natalie Sciver isn't tempted to go for a big stroke - she just bunts a single. "It would be really nice to have a pitch with a bit more bounce in it. Perry is having to bend everything she's got." Ellyse Perry looks a little frustrated as she over-steps her bowling mark for a second time. With three wickets already, she's clearly striving for what would be a second Test five-fer. Quick and nipping the ball in, she's a tricky customer. "What I'm liking about Elwiss is that she's just getting her hands through the ball, without being too elaborate. It makes a difference, it just keeps the momentum in the game." Holly Ferling, white ribbon in her hair, charges in and nips one back into the pads of Nat Sciver. Loud appeal. Not out. England need to reach 125 to avoid the follow-on by the way and we have 34 overs left in the day. Georgia Elwiss continues in a positive vein when the ball is too straight and whipped through the leg side for two. Then she picks up two more in a similar area. Clearly strong on her pads. Ellyse Perry is bowling heat-seeking yorkers almost at will - the 70mph toe-crushers being well dug out by Georgia Elwiss who is playing with a smile. Good probing stuff. Two from the over - a single and a no-ball. Nat Sciver is rivaling Katherine Brunt as my favourite cricketer in this England team - she has a classical technique but also a real steel about her as she glares back at the fast bowler after ducking beneath a bouncer. No quarter asked for, none given. Anyway, enough of my waffling... the England 100 is brought up by an edge through the slips which brings four for Georgia Elwiss. Then four more through the covers. Wake up, Mr Scorer. If Georgia Elwiss is ever asked what her first run in Test cricket was like, here's the answer: a scampered single to mid-on. She's up and running. Here's to 2,000 more. At the other end, Nat Sciver ducks under a bouncer from Ellyse Perry. "Nat Sciver has such simple, classical movements, she doesn't overcomplicate." I tell you what... Nat Sciver has a cover drive to match anybody in the men's game. It's a thing of beauty as she gets down low and in one fluid movement eases Megan Schutt through the covers for four. "Georgia Elwiss will be looking to make a statement. She didn't do much with the ball." Georgia Elwiss does a spot of gardening between deliveries - Ricky Ponting-like. Upright and compact at the crease, she looks a well-organised player as she watches the ball safely past the off stump. Guess what? Maiden. "You need to have energy in the crease, and what we're seeing at the moment is lack of energy, lack of footwork. If we compare it to the Healy-Jonassen partnership, there was a flow of runs. England need to find a new way." Georgia Elwiss is playing her first Test innings here, with an ODI best of 25 not out behind her. It's a tough ask to expect her to bail England out of this mess. Another maiden. Ellyse Perry completes a fabulous over with a sharp yorker which new batter Georgia Elwiss just about digs out. It started with a short ball which unsettled Lydia Greenway. Top-quality. Front foot planted, ball seamed in, Lydia Greenway is out. Leg-before. It pitched outside leg, but the umpire's decision is final. An 86-ball knock comes to an end. Two more added to the score when Nat Sciver slices four through gully. "What concerns me is that England don't seem to have spoken about how they are going to win this Test match." We have a run! Lydia Greenway hits the ball into the cover region and pulls her partner through for a single. Then we get a little tickle down to fine leg for four. England motoring now. "This is poor cricket - you have to have intent," says Jim Maxwell on TMS. It's slow going from the English batters as they struggle to pick up the ones and twos which help turn over the scoreboard. Maybe they should think about stepping out of their crease? Anything to put the bowlers off their length. Another maiden. "My gut feeling is there will be a run-out, because they'll suddenly feel the need to rotate the strike." England are being pinned down by the Australians, who are bowling the type of line and length which Glenn McGrath made a career out of. Giving nothing away, Sarah Coyte sends down another set of six dots. Lanning's tactic with regard to her bowlers seems to be to bowl them in short spells, ringing the changes frequently. She used the same measure during the ODIs. By contrast, at about this time yesterday, Brunt and Shrubsole had bowled 15 overs apiece. The Australians are all fitted with GPS trackers, which monitors how much work they are getting through. Apparently, the spin bowlers travel just as far as the fast bowlers over the course of a match. Maiden for Megan Schutt. Sarah Coyte almost begins with a maiden, but when she strays down leg Lydia Greenway elegantly flicks four down to fine leg. That'll do for England. “Walking around a cricket ground can always be entertaining. Having bumped into these young boys playing cricket and in between the sheer concentration, all three managed to tell me Katherine Brunt is their favourite player because they love how aggressive she is on the pitch." Afternoon all, Marc Higginson here. I've been thinking... never a good thing, I know. But, on the back of our footballing myths debunked feature, I want to know which are your favorite cricketing myths. It doesn't have to be scientific. Just random stuff. For example, it's a myth that Shane Watson is a "fast-medium bowler". More like medium. I won't rest up until he's reclassified. Anyway... you know the drill. Get involved at #bbccricket. Well let's be honest, that wasn't a great session for England. Australia have seized control of this match, rocking England with four early wickets. 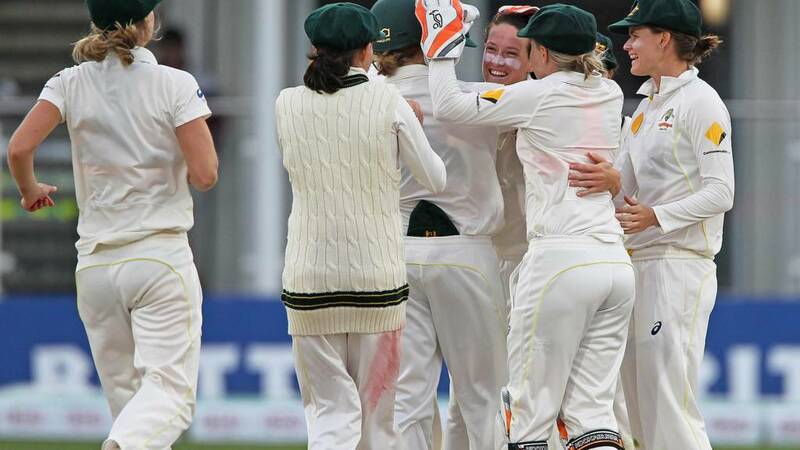 Ellyse Perry did the bulk of the damage early on, and after Australia claimed the key wicket of Charlotte Edwards, the wind completely went out of England's sails. The silver lining? Lydia Greenway and Nat Sciver got through to tea safely and can go again in the evening session. "That was a decent session for Australia, they will be very pleased with that." Jonassen to bowl the final over before tea. She beats Sciver in the flight with a lovely delivery that grips and turns past the outside edge. Fittingly, it's a maiden to end the session. "In terms of the speed through the crease, Meg Lanning reminds me of Simon Jones." Australia captain Meg Lanning brings herself into the attack to bowl some part-time medium pace. Greenway and Sciver rotate strike with a couple of sharp singles. "That's the release of pressure England needed. They couldn't get going against the seamers but they've had more success against the spinners." England were in the 60s for 12 overs. I didn't live through the actual 60s, but I think they may flown past quicker than that passage of play. Australia bring almost-centurion Jess Jonassen into the attack for a bit of tweak and immediately the runs start to flow again. Greenway gets her first run for yonks, and then Sciver rocks on to the back foot and absolutely batters Jonassen down the ground. That's better! "This is not Nat Sciver's natural game. She's known for hitting the ball hard - she's having to dig in here." There's still an hour to go until tea. I'm kidding. It's 10 minutes. Still, things are livening up as Natalie Sciver steals a couple of twos off Sarah Coyte's latest over. This is far from being the slowest innings recorded by a team in Test cricket. England Women hold that record, having taken 84.5 overs to reach 72 all out against Australia in Adelaide back in 1949. That equates to a run-rate of 0.84. England are scoring at about 2 an over today. “The morning rain perhaps put off a few fans but there a still a number of families dotted on grass banks around the ground, enjoying some of their picnics and some tense cricket. “A group of kids are making use of the pop-up food tent by using the sides of the tent as their net as they enjoy a friendly - and sometimes fiery - game of four-a-side cricket." These two are playing like they've got dumbbells in their pockets. It's another maiden. Greenway hasn't scored a run for 40 minutes. You officially have our permission to pop the kettle on. Have England forgotten how to run? We haven't had a single for...wait for it...16.4 overs. Even more bizarre, this exact pair were at the crease in the first ODI - and put on 122 in 21 overs. Weird. Anyhow, it's another maiden. Finally, finally, we have movement on the scoreboard as Natalie Sciver eyes up the last ball of Holly Ferling's over and slashes it down to third man, where it's hauled in just short of the rope. "England are drowning in dot balls." The good ship England has run aground here. Ferling propels down another maiden, and England have managed one scoring shot in the last 46 balls. Treacle. Simon Reed, Hartlepool: Who would you like to hear guest commentating on Test Match Special (a real person or fictional character)? I would quite fancy Alan Partridge. Tighter than a wallaby's pouch from Sarah Coyte - that's her third maiden in a row. "That's classic Nat Sciver - it's very simple, classical, she waits for the ball and plays through it. I don't think there's been a better shot than that." Natalie Sciver finally gets off the mark after 13 deliveries with a lovely flowing cover drive that races away to the boundary. Sarah Coyte keeps the thumbscrews clamped down with another maiden. "The three players England would want to stay there - Heather Knight, Sarah Taylor and Charlotte Edwards - are all back in the hutch." The new batter is Natalie Sciver. This is a very sticky situation for England now, with all their most experienced players back in the hutch and Australia's first-innings score of 274 looming far in the distance, like a mirage as England plod through the desert. What they need is a real heads-down, teeth-gritted, learn-on-the-job partnership. "She's out a number of ways - caught behind and she was bowled. Like a double hit in baseball." "That's what Schutt has been doing all day - bringing the ball in a whisker. You sense that England are exposed here." Things really heading south for England now. A faintly comical end for Charlotte Edwards, who is subject to a strong caught-behind appeal before everyone realises that the ball has nuzzled the off stump and disturbed the bail. That's the big wicket for Australia. A stroke of luck for England as Greenway again is tempted into reaching for a wide delivery and gets an edge that flies just past the outstretched mitt of Meg Lanning at slip. Georgia Elwiss and Anya Shrubsole are engrossed in a crossword book on the England balcony: Elwiss taking the 'filler-in' role with the pen, Shrubsole seemingly taking the lead with the answers. On the pitch, England are nearly '4 Down' as Megan Schutt slides one past the outside edge of Charlotte Edwards. That's Greenway's best shot so far, turning a rare loose delivery from Coyte off her legs for four. Remember the short-lived American rock band Good Charlotte? Well, this is an over that showcases both Good Charlotte and Bad Charlotte. The good: a clever glide from Edwards down to the third-man boundary and an authoritative punchy cover drive. The bad: an uncontrolled swipe at a wide delivery that loops up and drops agonisingly short of point. Close shave for the England skipper. "It's a tight game here, England are really battling away here." Ooh, that's none too convincing from Lydia Greenway, reaching well away from her body and squirting a wide Holly Ferling delivery aerially through gully. Ferling then gets one to jag back the other way and hit Greenway on the thigh-pad. nervy moments for England. "Charlotte has faced Ellyse for man years, she and Lydia Greenway are both experienced and have seen it all before. They just need to dig in now and bat for time." Edwards, who isn't short of a dramatic facial expression or two, shows her amazement as Perry gets one to stay low and almost sneak under her bat. Edwards responds in the best possible way, creaming Perry back down the ground for four. Good contest this. Ferling, who is capable of extracting a little more bounce from the pitch than the other Australian bowlers, is proving difficult to score off. A Charlotte Edwards single is all England manage off that over. "Edwards has got a good eye, that's for sure. She looks like an lbw candidate but she does pick the bowlers apart. She's clearly a class act." Australia scent blood in the water here. Ellyse Perry is recalled to the attack with England flailing like a stranded surfer. Der-ner der-ner. Perry nearly strikes too, rapping Greenway on the pads, but the umpire correctly adjudges that the ball pitched outside leg. Lydia Greenway is the new batter, and she's got quite the job on her hands as she and Charlotte Edwards attempt to arrest this nosedive. Greenway is down the other end as Edwards plays out a maiden. "Knight has looked good, she played some wonderful cover drives and perhaps it was a momentary lapse in concentration. And it comes just as England were rebuilding." England's brief revival is over. Sarah Coyte doesn't have a lot of pace but she is a very canny operator and eventually her nagging line and prodigious wobble pay dividends as she entices Heather Knight to drive loosely at a full ball and nick off to Meg Lanning at first slip. England in trouble. "There's a lot of excitement when you see Ferling running in because of the bowler she is and the bowler she can be." Now then, another new bowler for England to get to grips with as Holly Ferling replaces Ellyse Perry. Ferling is a bowler you can file under 'pacy but raw'. It's a decent start from the Aussie quick, the one error a leg-sidish delivery which Knight clips deep into the leg side for two. Australia make their first bowling as Sarah Coyte replaces Megan Schutt. She's a purveyor of nagging medium-pace, and Charlotte Edwards'charge is momentarily halted: she blocks out a maiden. The runs are beginning to flow now for Charlotte Edwards - Perry overpitches and watches the ball zip back past her toes off the perpendicular blade of the England skipper. Top shot. And no sooner had I said that than Charlotte Edwards gets a big stride forward and unfurls a lovely cover drive that rolls away to the fence. A first boundary for the skipper. And having found her timing, she follows it with another, clipping one wristily off her pads to the midwicket boundary. Good over for England. Do you know your slip from your square leg? If you're just getting into cricket and are wondering about some of the weird and wonderful terminology to describe fielding positions, hopefully this graphic helps. England are beginning to show a little more urgency here - Knight and Edwards pinch a few singles off the dangerous Perry. The boundary rope is proving pretty hard to find though. England couldn't have a better player at the crease in Charlotte Edwards - the second highest run-scorer in women's Test cricket of all time. Ellyse Perry got away with one there: she overstepped but wasn't called for a no-ball. Have umpires just stopped checking the front foot? We've seen plenty of that in the men's Ashes. Quite frankly, England could do with any runs they can get at the moment. Charlotte Edwards has begun her innings in ultra-cautious mode but it almost comes back to haunt her as she leaves one from Megan Schutt that nips back sharply and nearly nudges the off pole. Finally, Edwards gets off the mark, after 16 balls, with a streaky drive through cover. Pressure building here: England playing the cork in the bottle, Ellyse Perry providing the fizz. Dot ball follows dot ball follows dot ball. Something's gotta give. Andy, Worcester: Ellyse Perry was a class above everybody else at New Road. She could rip through England's batting today. It's a sedate over - not much bounce or venom from Megan Schutt, not much aggression from Charlotte Edwards. The England captain is quite content to remain marooned on 0 off 11 deliveries. "Perry is in the groove here - she glides through the crease and bowls at a lively medium-fast." Perry, the Blonde Assassin, continues, with that distinctive Rambo-esque smear of suncream across her nose and cheekbones. Charlotte Edwards has seen it all before of course, but even she can't be relishing the prospect of facing Perry in this mood. In fact, she doesn't have to, as Heather Knight blocks out a maiden. Decent shape from Megan Schutt as she gets one to hoop back into the pads of Charlotte Edwards, but the England skipper plays it away confidently. "The one place where I think women's cricket needs to raise its game is running between the wickets." So England well and truly on the ropes after three overs. Captain Charlotte Edwards, just like Michael Clarke at Trent Bridge, has to leave the sanctuary of the dressing room a lot earlier than she would have liked. "I know Sarah Taylor has got a big trigger movement and Perry has got her plumb. She's trying to work it too far over to leg." Disaster for England! Sarah Taylor is out first ball, pinned on the pads by Perry right in front of the timbers. "That was a very difficult ball to face, but it shows how much life is in the pitch - England's bowlers didn't get lift like that." "That was a fine piece of bounce bowling with a little bit of movement." Ah. An early spanner in the works for England. It's an absolute snorter from Ellyse Perry, on a fourth-stump line, bouncing viciously off the pitch and shaping away, and the ball just brushes the glove of Winfield on its way through to the keeper. "I'm hearing that Kirsten Beams is struggling with her calf. That's going to hurt Australia." Lauren Winfield gets off the mark with a nudge off her pads. An early nerve-settler for her. "I think Jonassen lacked a little urgency to get to three figures - she had a chance to take two but took one." Former Aussie wicket-keeper Ian Healy, who was talking on TMS over the lunchbreak, is not only the uncle of Alyssa Healy, taking the gloves for Australia in this match, he's also got a son who is currently keeping wicket for Australia under-19s against England. Strong wicket-keeping genes in that family. Jess Jonassen will be kicking herself after that dismissal on 99. What a sickener. But she's also a purveyor of very handy spin, so she has the chance to make amends in the field. Thanks Higgy. An interesting afternoon session in prospect then, as England look to make some inroads into that fairly imposing Australian first-innings score. And on that note, it's time for me to hand over the live text baton to James Gheerbrant. I'll see you later. The good news for England is that the weather is set fair for the rest of the day. We can play until 19:30 BST to get in the 85 overs left in the day. Former Australia wicket-keeper Ian Healy on TMS: "Nathan Coulter-Nile is one who might take over from Ryan Harris eventually, and he's got the all-round capabilities as well. Joe Burns is a future Test match player - maybe he's the one they're grooming for Chris Rogers' role." Former Australia wicket-keeper Ian Healy on TMS: "There is gloom but not doom. We'd like a little more depth in batting, but those guys who get the job will be good enough, it's just a matter of whether they believe it. The new era has already started with the selection of the one-day squad." Former Australia wicket-keeper Ian Healy on TMS: "Clarke usually bats with a spring in his step and a spark in his eyes. But all series he was very heavy. He just couldn't get anything going." Former Australia wicket-keeper Ian Healy on TMS: "I can't believe the Ashes are over. It feels like they haven't even started. The Australians are good batsmen, but their technique has deserted them." The TMS team have just replayed commentary of Australian wickets falling while Ian Healy is on air with them. Cruel. Akin to stocking your fridge with goodies and then coming back to see it's been raided by the kids. Or something like that. Email Message: David in Spain: Hope we're not all getting sentimental. While the game's on Aussie wicket is an Aussie wicket, men or women, on 0 or 99. Well played Jonassen, but no false regrets over a century missed. David in Spain: Hope we're not all getting sentimental. While the game's on Aussie wicket is an Aussie wicket, men or women, on 0 or 99. Well played Jonassen, but no false regrets over a century missed. Former Australia wicket-keeper Ian Healy on TMS: "If you're not executing everything the same when your wife is there as when your wife is not there, then you need to make sure you change it. Otherwise it becomes a distraction, so you need to constantly monitor it." Ian Healy is on TMS now - discussing the issue of wifes and girlfriends on tour. He had been quoted in an article in Australia suggesting that WAGs being on tour was detrimental for the squad. "Remember, England failed to chase 200 in the last two ODIs, so 274 is quite a big total." Charlotte Edwards looks a tad relieved on the players' balcony as she heads back inside to take her pads off. She looked to be doing a little interview with a journalist there too. No rest when you're the skipper. And that, ladies and gentlemen, is lunch. England get through unscathed. "A lot of the Australian wickets were due to poor foot movement, but Heather Knight got a big stride in there." Heather Knight gets England up and running with a superb drive to the cover boundary. Pure timing. "Perry is going to be trying to take the ball away from the right-hander. The key is that with the slope, you think you have to play at things that you don't have to." Great start by Ellyse Perry who shapes one past the outside edge of Heather Knight's bat. So, five minutes before lunch, the players return to the middle. Ellyse Perry will take the new ball for Australia.